Timeless interiors evolve around key furnishings that anchor the room—allowing colors, fabrics, and accessories to create visual interest that can easily and affordably be changed with the seasons or trends. With 35 years of experience designing well-appointed homes, design expert Deborah Hastings shares her favorite style secrets to achieving good design that can be applied to any home on any budget. Whenever a trend is so popular that you can buy it everywhere, it is time to start avoiding it. It’s not a snob thing—it is a saturation thing. We are fickle. When we see too much of something, we get tired of it much faster. Rule of thumb—enjoy a few items to liven up your interior, but don’t load up on the current rage. You will be tossing it all out and chasing the next “must haves” way too soon. Shop in luxury stores even if you can’t afford them. Just tell the sales clerk you are browsing and pay attention to details. Again, it’s not a snob thing. This fine-tunes your eye to see quality so you can translate it into something you can afford. If you are feeling insecure about putting things together, consider hiring a professional. Most designers work by the hour. One hour of consultation could help clarify your plan. Free design help is sometimes available in retail stores as a service to customers. For key furnishings to anchor a room, look to the classics. Certain iconic shapes are always on point. A wingback chair, a Chippendale dining table and chairs, and for more modern classics the Eames chair and Saarinen tulip table will always be a solid investment. So where are the best places to shop? Everywhere. Consignment shops and estate sales are a treasure hunt for those of us with the time to scout them. The internet allows you to browse in your pajamas, but read the dimensions and reviews carefully. Buying through local artisans and stores gives you the opportunity to see the item before buying and even take it home to try. Measure the space you are buying for and have a flexible master plan before shopping. 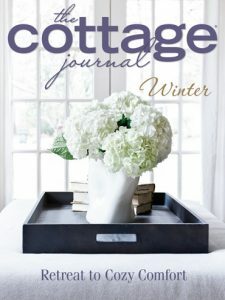 Find out where Deborah suggests to shop in The Cottage Journal Winter issue! Add Alexandra Stoddard to your reading also..I have treasured her thoughts and ideas for many years.It’s fun to browse in the shops and then find that special something…. Excellent advice! Less is more. One quality piece will always outshine numerous cheap ones. We have found numerous quality pieces at resale shops – mahogany tilt top tea table, 1940’s solid cherry card table, a Chinese tea caddy lamp are my favorite finds. Reading widely is an excellent way to learn and develop one’s taste but so is getting out and looking in person. I like to waltz through fancy hotel lobbies to see whether they have any ideas. Cafés and restaurants also are great for inspiration. Perfect tips for anyone looking to develop more of their own design style at home! Reading everything, viewing things you love, and getting out there to visit and see high quality pieces of furniture, antiques and art will give you the “eye” and knowledge to seek out high quality pieces no matter what your budget, and help to figure out what your own beautiful personal style is. Creating a warm and welcoming home begins by surrounding yourself with the things you truly love. Happy New Year to all my “Hoffman” friends. I always feel inspired and energized with all the guests that grace Phyllis’s blog. These interior design guidelines affirm that we non professionals can create a beautiful space. When asked one time, Lynette Jennings responded to a question about where she gets her ideas. “Read everything you can get your hands on and eventually you will develop your own style”. I love the idea of browsing through high end shops. So throw on your skinny jeans, best sweater coat and ankle boots. Have fun!